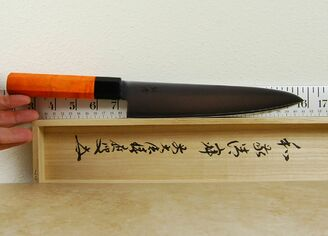 The Yahiko 210mm gyuto featured here is stamped from a VG10 stainless steel san-mai sandwich, which has been heat treated to 60 Rockwell. 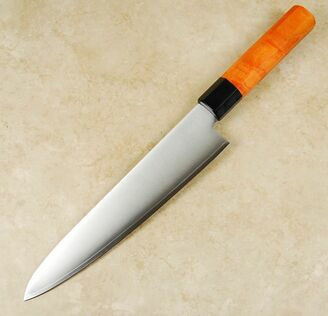 This is one of the most popular stainless steels used in knife making, for good reason. It has good edge retention and is very wear and corrosion resistant. We have designed this knife for all-around versatility in cutting and chopping. The shorter length allows for use on small boards and in restricted spaces. 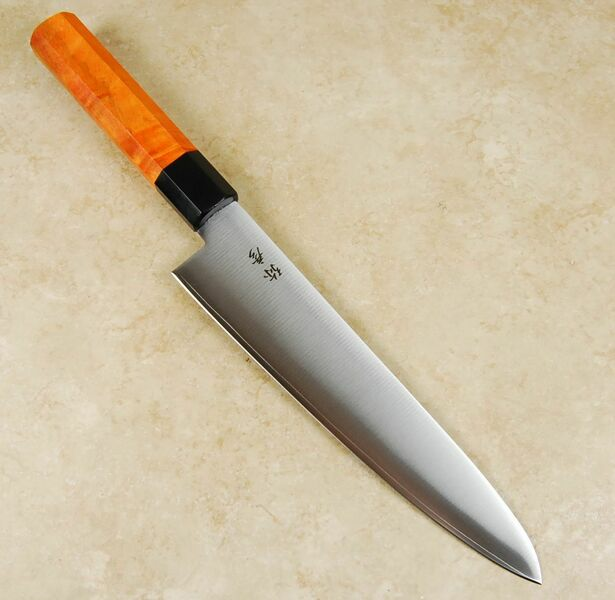 It is also a very comfortable knife to handle and makes a great choice for chefs new to Japanese knives or who are looking to refine their cutting skills. It is not a tall blade so those with smaller hands will find it a good proposition in terms of lighter weight and ease of use. The shorter dimensions also make it able to deal with larger ingredients as well as small items and intricate cutting and slicing techniques. 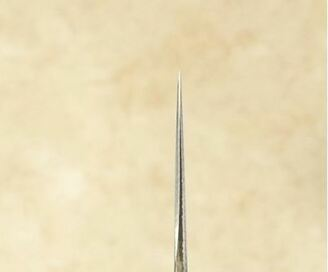 We are making some of these great blades available with selected custom handles made by our favorite woodworkers. We will update the pictures and specifications to match the latest available combination. Good steel and a sweet custom handle at an unheard of price! This won't last long!